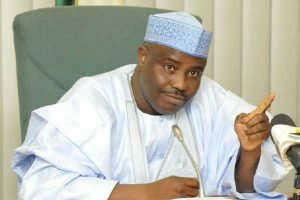 Governor Aminu Tambuwal of Sokoto state on Sunday survived the tough challenge of Ahmed Aliyu and his godfather Senator Aliyu Wamakko of the All Progressives Congress to win re-election for a second term. Although he lost in the collated result for 35 polling units in Kebbe LGA, he was able to edge his opponent, his former deputy, by retaining the lead, winning by just 341 votes. He polled 512002 votes, while his APC challenger got 511661 votes. After the results from 21 LGAs were tallied, Tambuwal led with 2057 votes, after polling 506,545 votes. Aliyu, his APC challenger had 504,488 votes. However, the margin of APC’s victory in Kebbe was not enough to change the final picture. APC polled 7177 votes while PDP got 5457 votes. The returning officer Professor Fatima Mukhtar, vice chancellor of Federal University of Dutse is set to announce the final result for all the 22 LGAs. Albarka FM places emphasis on neglected perspectives and discussions on important local, national and global issues, reflecting values of peace, social justice, human rights, democracy, multiculturalism, freedom of expression and social change. Copyright © 2017 Powered By Albarka, Design By Highlydemanded.